Lockout tagout (LOTO) is a lock and tag safety procedure used in industrial and R&D settings. Its purpose is to ensure forklifts and other dangerous pieces of equipment are shut down and can’t be restarted until they’re once again safe to operate. In simple terms, lockout involves placing a lockable device such as key or combination padlock on a piece of equipment to make it temporarily inoperable. Tagout is a clearly worded and highly visible warning sign that’s attached to a forklift or other dangerous piece of machinery. Tagouts are used to advise workers that the equipment is either undergoing or is about to undergo maintenance or repair and can’t be operated until the work has been completed. In some situations, OSHA will allow tagouts to be used in place of lockouts, but only when there’s no place on the equipment to attach a lockout device and the employer can demonstrate that a tag will provide the required level of worker protection. Forklift lockout tagout procedures and practices were originally put into use to protect forklift operators and other workers from being injured by machinery or equipment that could unexpectedly start through what is known as hazardous energy. This can happen while equipment is being repaired, during power outages, when the equipment is out of service for routine maintenance and other times when operating the equipment would be unsafe. Hazardous energy includes electrical, mechanical, hydraulic, pneumatic, chemical and thermal energy sources. Lock out tag outs are required by OSHA to protect forklift operators and their coworkers, and are often the last line of defense against avoidable workplace accidents and injuries. OSHA’s standard for controlling hazardous energy through LOTO procedures is covered by Title 29 Code of Federal Regulations (CFR) Part 1910.147, which addresses the procedures for disabling forklifts and other equipment to prevent them from being started when they’re down for maintenance or other reasons. OSHA estimates that lockout tagout procedures prevent 120 fatalities and 50,000 injuries each year. For more information on hazardous energy and LOTO devices, see the OSHA lookout tagout Fact Sheet. – Keep employees a safe distance away from the LOTOed piece of equipment at all times it’s under lockout tagout. For more information on forklift lock tagout procedures, see OSHA’s Lockout Tagout Tutorial. Forget expensive third party solutions. ForkliftCertification.com’s instructors are highly knowledgeable and experienced industry professionals who know what’s critical for you to learn. Click here for a complete list of FLC’s training packages. Forklift Certification.com is the leading provider of OSHA-approved online forklift operator training and certification. 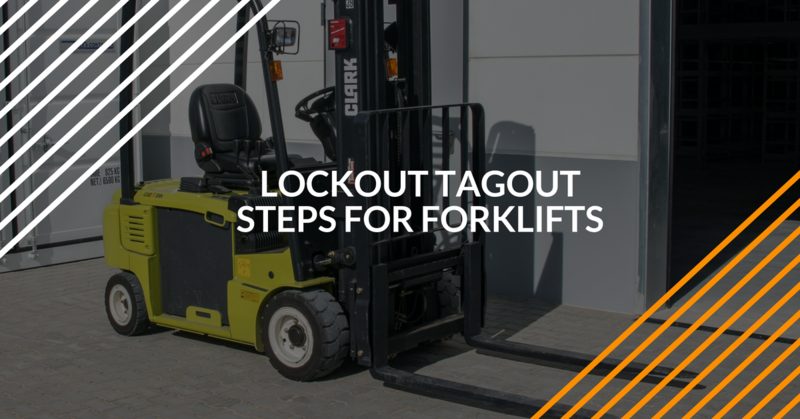 We have the tools, knowledge and resources to ensure that both employers and employees learn everything they need to know about forklift lockout tagout policies and procedures. We offer a variety of classes for training equipment operators of all skill levels from beginners to the highly experienced and everyone in between. Lockout tagout policies and procedures for all types of powered industrial trucks and forklifts, including pallet jacks, indoor forklifts, warehouse forklifts, rough terrain lifts and order pickers, are among the topics covered in FLC’s fast, easy and affordable forklift training programs. Safety training, which includes forklift lockout tagout procedures is just one segment of FLC’s OSHA-approved Forklift Training and Certification Program. Our fast, easy and convenient training packages cover all types of forklifts and pallet jacks at a price that’s affordable. What’s more, the refresher training OSHA requires every 3 years or following a workplace accident involving a forklift is free for life. FLC’s online training takes only about an hour to complete, and since all class materials are available online 24/7, forklift training can be completed using a smartphone, tablet or laptop any time and anywhere there’s an Internet connection. Need more information? You can get started today by contacting us online or calling us at 888-278-8896. Thanks for taking the time to visit ForkliftCertification.com. We look forward to helping you with all your forklift operator training needs.